I made this salad today for lunch, and it was SO good! I highly recommend that you try it. Even my six year old couldn’t resist the yummy smells coming out of the kitchen, and enjoyed a bowl of the finished product with her lunch. Not sure you like quinoa? Do you like rice? I think it really has the same texture as rice, but it’s so much more nutritious, and high in protein, too! BONUS! Not sure you like kale? I found a giant bag of ‘baby’ kale at Costco, and it’s much more tender and mild. Good for adding to salads, or sautes…quite nice. Bring water to a boil in a saucepan. Stir quinoa into the boiling water, reduce heat to medium-low, place cover on the saucepan, and cook until water absorbs into the quinoa, about 15 minutes. Remove saucepan from heat and let rest covered for 5 minutes. Remove cover and allow quinoa to cool completely. Whisk olive oil, lemon juice, Dijon mustard, garlic, pepper, and salt together in a bowl until oil emulsifies into the mixture; drizzle over kale. 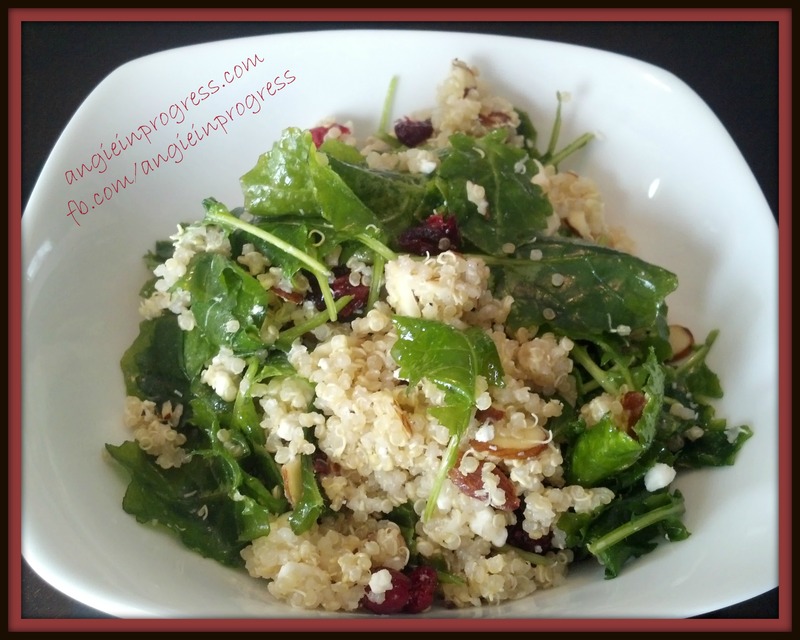 Add cooled quinoa, almonds, cranberries, and feta cheese to the dressed kale and toss to incorporate. Just bought a ton of spinach. Do you think that would be good instead of kale? Yes, you could absolutely substitute spinach. The kale would hold up a little better over time, so if you were packing lunches ahead for the week…it would stand up a little better to the dressing with kale maybe…but it would be just as tasty! Next PostNext Groundhog Day – Virtual 5K!